Though never all that stylish, Honda's Accord and Toyota's Camry always have been smart and sensible. The Camry and Accord hit their stride in the 1980s, when they became the epitome of the American mid-size sedan. Since then, both have evolved to keep pace with excellent new family sedans from Ford and Subaru. Still, styling is a good place to begin to compare them. When the current car was introduced in 2012, the Camry wore a purely evolutionary look—in other words, boring. 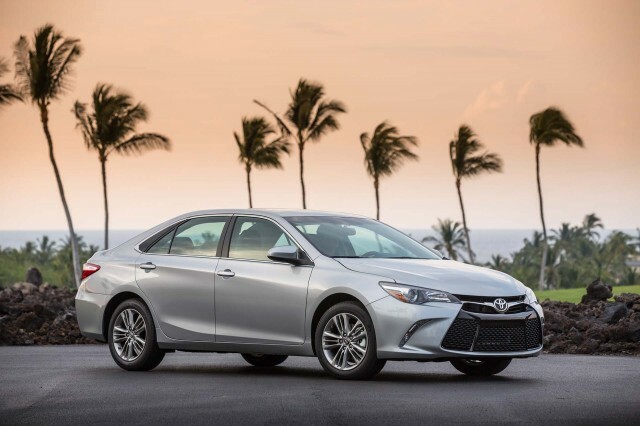 For the 2015 model year, Toyota redesigned it, with a striking front end and a sweeping side view. Inside, the inexpensive, cobbled-together look has been erased, with a more handsome look given to the dash and a higher grade of trim. The Accord still looks slightly more exciting and better proportioned on the outside, and it wears a new nose and tail that arrived for the 2016 model year. It also has more of a premium look inside. Of course, both of these models have been upstaged by vehicles like the Kia Optima and the daring Ford Fusion. The Camry is downright dull to drive, although it has a more responsive feel in SE versions; on the other hand, the Accord gets the higher score here because of its well-tuned steering and crisp, light driving feel. Both models are very smooth with their base 4-cylinder engines, and despite using a CVT, the Honda doesn't succumb to the undesirable drone and rubber-band feel that CVTs so often do. These are two of the only remaining mid-size models to offer an available V-6, and in both cases it's a smooth, refined, and very strong option. In the Accord especially it gives this Honda more of an Acura feel. Each of these big sellers has offered a hybrid edition. The Accord Plug-In Hybrid has gone on hiatus for 2016, to return in 2017 with a different combination of engine, batteries, and motors. 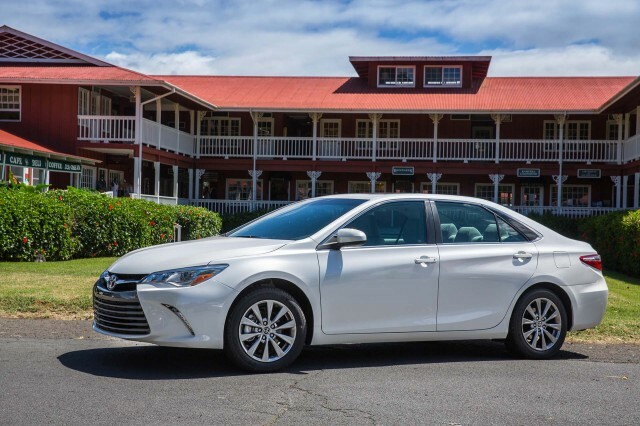 Until then the Camry Hybrid's numbers (43 mpg city, 39 highway, 41 combined) reign supreme here for fuel economy—and based on our drives, it has very smooth hybrid integration. 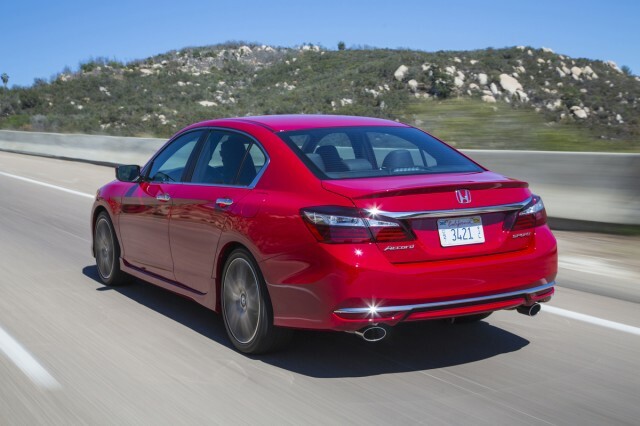 Across the rest of the lineup, the Accord outpoints the base Camry and the upscale V-6. The Accord is the winner in comfort and space, too. The Camry's base front seats are rather flat; SE seats are better. The latest Accord has more support, and most drivers will prefer the Accord EX's trim and materials to those in the Camry LE. In back, both cars have rooflines that preserve headroom; carrying adults in the back seat is fuss-free. With its rather low beltline and a little more side glass, the Accord offers a slightly better view outward for those in back—possibly eliminating the need for Dramamine. Toyota and Honda have paid more attention to refinement this time around and added extra noise insulation, but thanks to standard Active Noise Control and Active Sound Control on the Honda Accord—which especially help cancel out road noise—the Accord is the clear winner here, too. 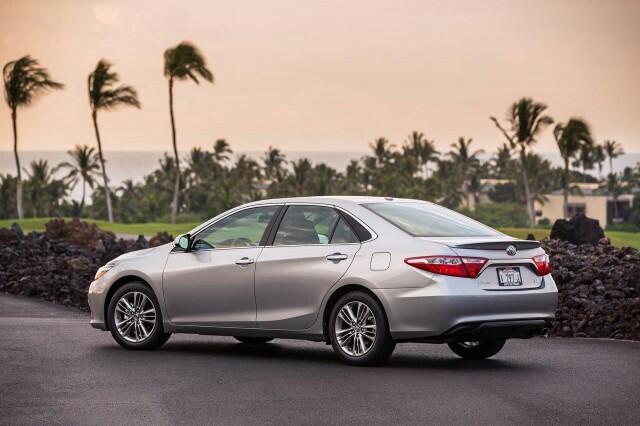 For ride quality, the Camry is the softer of the two in most of its trims, although the Accord's firmer calibration brings crisper handling response. We consider these models to be near equals for safety, as they both have earned "Good" ratings in all the traditional frontal, side, and roof strength categories from the IIHS—and in the tough new small-overlap test. Both are Top Safety Pick+ award winners. 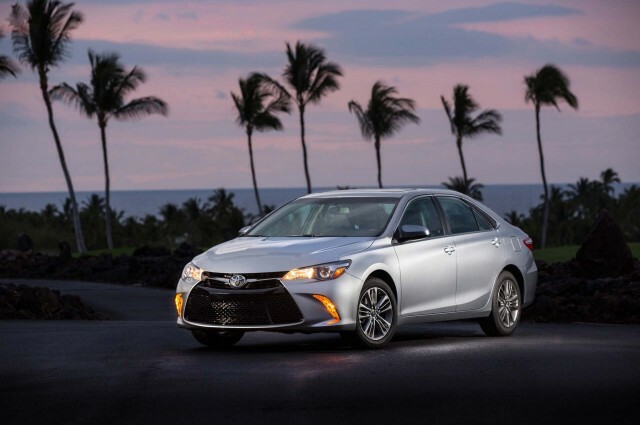 The Camry missed top federal ratings; although it gets a five-star overall rating, its four-star frontal results add up to a vehicle that's not quite in the same echelon as the Honda Accord or Subaru Legacy. Each of these sedans offers some of the latest accident-avoidance technology, as standard equipment or as an option, in the form of adaptive cruise control, lane-departure and forward-collision warnings. Honda's LaneWatch camera is a nifty touch: it shows the curbside view to the right when the turn signal clicks that way. The Camry offers a more conventional, and we think preferable, blind-spot monitor as well as a rearview camera. On either car, those features are options or bundled into the priciest models, though. 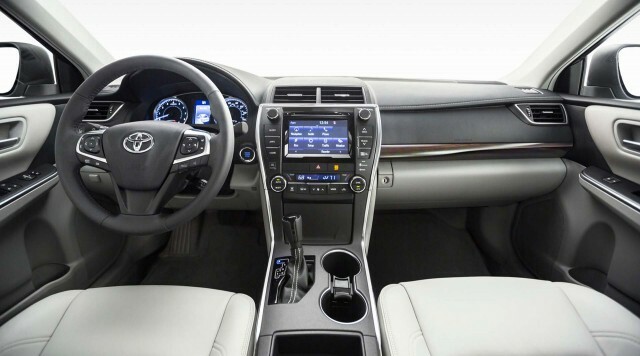 The market has evolved to expect connectivity features even in lower-priced vehicles, and both of these models cater to that expectation, with standard Bluetooth hands-free calling, Bluetooth audio streaming, and a USB port. But Honda has gone well beyond that, also including SMS text capability, Pandora audio streaming, dual-zone climate control, and an 8.0-inch i-MID display. Provided you're looking at one of the more affordable trims, we think Honda is the winner here, too—by an overwhelming margin. While the Camry doesn't lag far behind the Accord in any one way—well, except styling, perhaps—Honda has produced a more compelling design and driving experience that still hits all the marks for practicality, comfort, and features. Pleasant and thoroughly modern, the Accord isn't the sexiest thing in its class—but that's okay. CVTs aren't our favorite transmissions, but the Accord makes up for that with its excellent ride and handling. Honda has fitted the Accord with a nice interior with excellent space for all passengers. 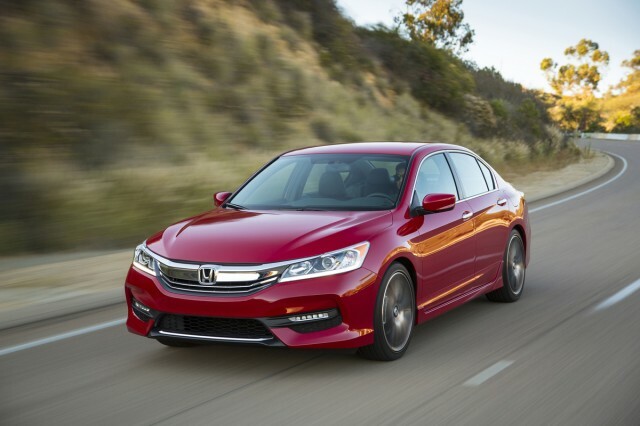 The Honda Accord scores nearly top marks from the IIHS and the NHTSA. 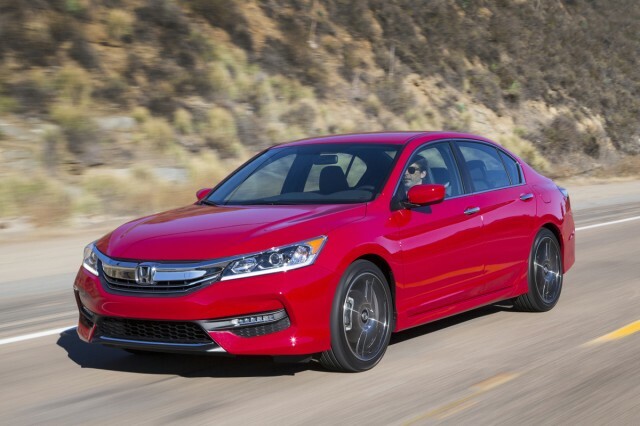 Honda no longer skimps on the base Accord, but there are no individual options for any trim level. The Accord is a fuel-sipper, but some rivals now best it. We have sent your request for price quotes on the 2017 Toyota Camry and 2017 Honda Accord Sedan to the dealers you requested. They should be in touch shortly. Your request for a fast, free price quote on a 2017 Toyota Camry and 2017 Honda Accord Sedan is in process. The CarsDirect Dealer(s) listed below will contact you shortly to discuss your request and to provide a quote.